NMM 6765. Electric Guitar by Gibson Guitar Corp., Nashville, October 25, 1991. SG Junior model. Serial number 92981312. Autographed for charity by Nashville celebrities. The SG Junior electric guitar was introduced in 1961 to replace the Les Paul Junior. It featured the double cutaway body and flat top of the SG with the basic hardware of a student instrument. It was discontinued in 1971, but reintroduced as a classic, limited-run model from 1991 to 1994, when it was once again discontinued. 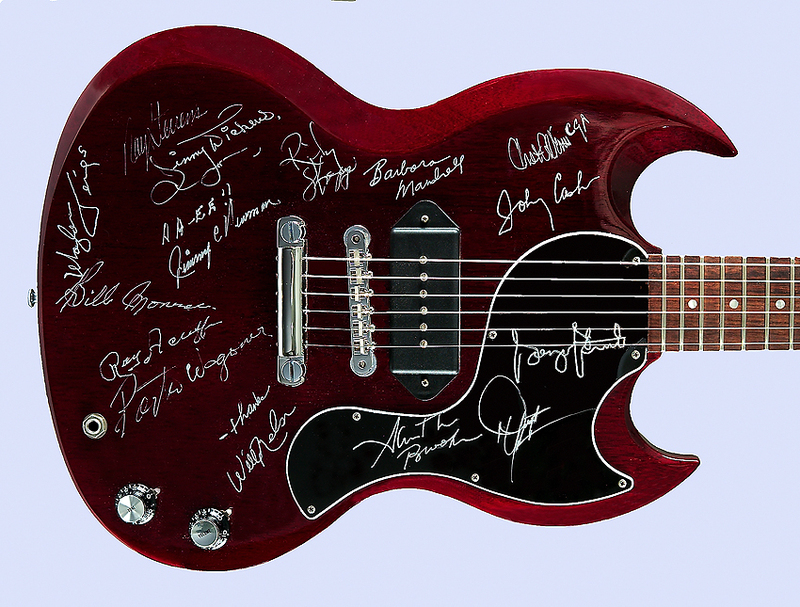 Country music stars who autographed this guitar for a charity auction include the following: George Strait, Garth Brooks, Willie Nelson, Porter Waggoner, Roy Acuff, Bill Monroe, Waylon Jennings, Ray Stevens, Jimmy Dickins, Jimmy C. Newman, Ricky Skaggs, Barbara Mandrell, Chet Atkins, Johnny Cash, and Hoyt Axton.